Note: 1.8 versions and newer depend on the Chameleon library. Put your most frequently used items within convenient reach. Storage Drawers borrows ideas from Jabba and Bibliocraft, resulting in a highly functional, compact, and aesthetic storage solution that is meant to complement rather than replace those mods. There is no traditional slotted inventory with these containers. Interaction is click-based similar to Jabba. Clicking on one of drawers on front will interact with that drawer. Right-Click: Insert full stack in hand into drawer (or partial stack if the drawer fills). Double-Right-Click: Insert all compatible stacks in inventory into drawer (or until drawer fills). Left-Click: Remove a single item from the drawer. Shift+Left-Click: Remove a full stack from the drawer. Shift+Right-Click with empty hand: Open a UI to see exact item counts and manage applied upgrades. The shift-click behavior is reversed from Jabba. This is based on the theory that you normally interact with stacks in Jabba, but will want to normally interact with single items in Storage Drawers. The controls can be reversed in the mod config to match Jabba. The wooden drawers are the main storage block in Storage Drawers, and they come in a variety of configurations and styles. You can pick from any of the Vanilla plank colors when crafting to get a matching block. Half-size 2x2: Stores 4 stacks per drawer. Half-size 1x2: Stores 8 stacks per drawer. Full-size 2x2: Stores 8 stacks per drawer. Full-size 1x2: Stores 16 stacks per drawer. Full-size 1x1: Stores 32 stacks per drawer. Capacity can be further boosted with storage upgrades. Upgrades do not need to be applied in sequence, so you can pick the size you need from the start. If you need an estimate of how full your drawers are, indicator upgrades are available to put a fill bar on your drawers. Level 1: The indicator bar will light up when the drawer is full. Level 2: The indicator bar will fill proportional to how full the drawer is. Drawers can also be locked or unlocked with the drawer key. When a drawer is locked, it will maintain its current item association even if the last item is removed. This will prevent pipes and other transport systems from re-filling that drawer with other items. Addon packs for additional wood types are available for some mods. See further down for more information. Compacting drawers are a special stone-colored drawer that auto-convert compressible items. Instead of manually crafting and uncrafting between gold blocks, ingots, and nuggets, put them in a compacting drawer. The drawer will internally maintain a pool of the material, and let you insert or remove the material in any of the shown forms. The compacting behavior applies to any item with a compressed recipe, including redstone, glowstone, wheat, and many others. Drawer Controllers are the second special block in the mod. They will search for any connected drawer within 12 blocks, and then expose all of those drawers as a large combined inventory. This lets you hook up a single pipe, tube, duct, spark, storage bus, etc. and interact with the entire bank of drawers. The second function of the controller is as a deposit-only interactive block. By right-clicking on the front face with an item, the item will be deposited into the connected network. By double-right clicking, it will attempt to dump your entire inventory. Items will only be dumped if they already exist in the network, allowing you to clear out a bunch of mob drops or farmed crops without literally dumping your entire inventory. Controller Slaves act as an extension of a drawer controller, exposing more faces for attaching machines, pipes, or crafting frames. Controllers will bind to a slave when they find them on the network, and all slaves bound to the same controller will share the same inventory and range as that controller. Unlike drawers, slaves cannot be shared, and you should be careful to not put them in range of multiple controllers. Using controller slaves is better for performance than using multiple controllers. Trim blocks are decorative wood paneled blocks similar to wooden drawers, but they can also be used to connect drawer blocks within a controller network. While some players choose to use Storage Drawers as a replacement for other storage mods, it works best with others. If aesthetics are important, the drawers complement many of the Bibliocraft blocks. Drawers are compatible with Jabba's dolly, letting you move around filled blocks without needing to empty their contents and break them. Special compatibility is added for Thaumcraft, displaying an aspect label for the difficult-to-distinguish essentia-based items. All drawer blocks are compatible with Applied Energistics 2 storage buses, and this is the preferred way for seeing the exact contents of a drawer. A special consideration for compacting drawers: the full amount of blocks, ingots, and nuggets will be listed by the system, even though those amounts cannot exist simultaneously. WAILA will list the inventories of drawers, including their exact counts. A MineTweaker API is available for controlling the ore dictionary conversion whitelist and blacklist. Every block and item can be individually disabled in the mod's configuration file. If you ever run into trouble with a specific block, like the controller, disabling the block will let Forge remove it from your world without needing to disable the entire mod and lose all your stored items. Many individual features and aspects of the mod can also be changed in the configuration, including base storage sizes and recipe outputs. The full configuration is available through Forge's mod config screens, accessible from the title screen. 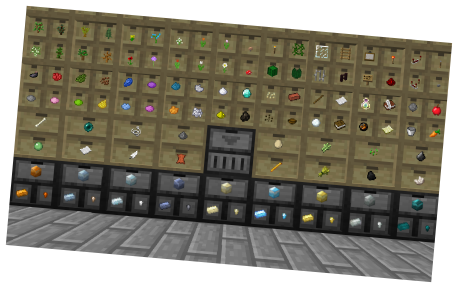 Storage Drawers Extras is a unified addon pack that creates drawer variants from wood blocks of other mods. Major supported mods are Biomes O' Plenty, Forestry, and Natura, though others may appear over time. Drawers & Bits is a companion mod created by Belgabor that adds versions of the controller and compacting drawer that work specifically with the bits from the Chisels & Bits mod. Just to give you (all) feedback. Computronics and OC are now able to see the drawer controller as a component (just put an adapter block beside the drawer controller, the adapter don't even need any upgrade inside it, connect it via cable and check for components in your computer, et voila! )...pretty awsome!! 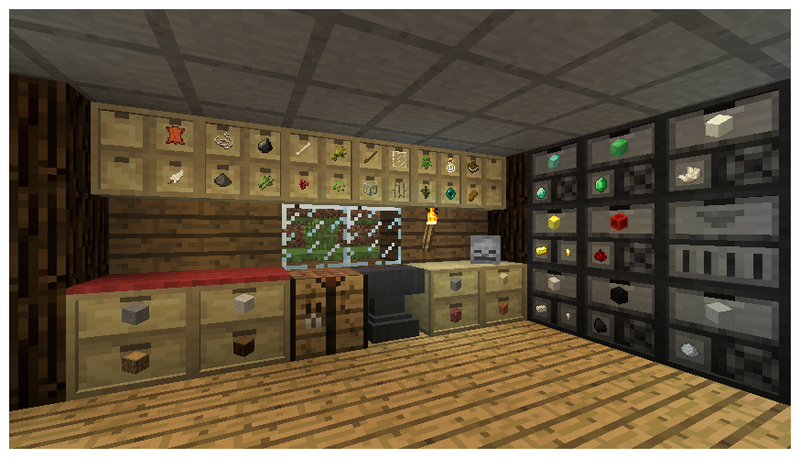 Using latest 1.8 version StorageDrawers-1.8-2.1.4: There is a duplication bug with compacting drawers. The Idea with this Controller is really amassing. But... is there an possibility to make him compatible with JABBA-Barrels? It would be awesome if you are able to integrate this Barrels in an Drawer-Storing-System. I realy love this Mod,.. Best storage system there is in my opinion! Thaumcraft pack, perhaps? For the two woods in it, I mean. Not a dedicated pack. I intend to do a misc pack for the onsie-twosies like Thaumcraft and Witchery. Is there a maximum number of 'Controller Slaves' that are usable with a 'Drawer Controller'? No, it can be as many as you can fit within the controller's range, and they are cheap. So they're not range extenders, just connectors eh? And the Controller sees 6 blocks in any given direction? Right, they don't extend range. The controller sees more than that, though. The controller has a range of 12 blocks in any direction, or put another way any connected drawer within a 25x25x25 cube centered on the controller. The slaves came about from people wanting to attach super crafting frames to their network, and needing a separate controller for each one due to lack of available faces. Oh wait.. so it should see any connected drawer within 12 blocks in any direction? Hmm, is there a maximum number of drawers it can address within that space? I've run across drawers 7 blocks away from a controller (on the diagonal) that aren't getting addressed. I'll go back and recheck my distance on things. There needs to be a strong chain of connections between the controller and the drawer. It won't see anything on a diagonal. You can use trim blocks to connect around corners - that's mainly what they're for. The entire chain of connections must be contained within the 25 block cubic zone. If I use controller slaves to connect 'around corners' that should catch everything on a 'curved' structure, right? Also trim blocks, I don't think I've ever used those, I'll go investigate thanks. Yes, slaves will also work. Drawers, controllers, slaves, and trim are all "networkable".